Considered one of the most prestigious and difficult sports to master, it is no wonder that Rolex is a strong supporter of golf. From sponsoring the game’s greatest tournaments to partnering with some of the best players in the sport’s history, Rolex is one of the most prominent brands in golf. Tee up and join us as we explore Rolex’s involvement with golf and golfers around the world. Rolex’s relationship with golf began in the 1960s when the brand officially teamed up with Arnold Palmer, Jack Nicklaus and Gary Player—known as the Big Three—who went on to become absolute legends in the sport. Wow… what an emotional roller coaster ride!!!! Thank you so much to my family, friends, team, sponsors and fans for all believing in me, and no matter what, always keeping me patient, and positive 🙏 without you guy’s this moment would have never happened, and I cant thank y’all enough ❤️❤️❤️ I can officially say this has been one of the craziest most surreal weeks of my life!!! Since then, the brand has continued supporting a diverse range of top golf players. For instance, the most successful female golfer of all time, Annika Sörenstam is a long friend of the brand. Plus, the young Lydia Ko, who made history by becoming No. #1 at just 17 years old, is also a part of the Rolex family. Other current female golfers who are part of the Rolex roster include Anna Nordqvist, Lexi Thompson, and Brooke Henderson. On the men’s side, Rolex counts a whole host of golfers as official brand ambassadors including one of the most famous golfer of all time, Tiger Woods. There’s also Phil Mickelson, who famously wears his Rolex Cellini watch on his left wrist while playing. Adam Scott, Martin Kaymer, and Jason Day are also officially sponsored by Rolex, as are Jordan Spieth, Justin Thomas, Rickie Fowler, Hideki Matsuyama, Jon Rahm, Thomas Pieters, and Brooks Koepka. An impressive list of golf champs indeed! 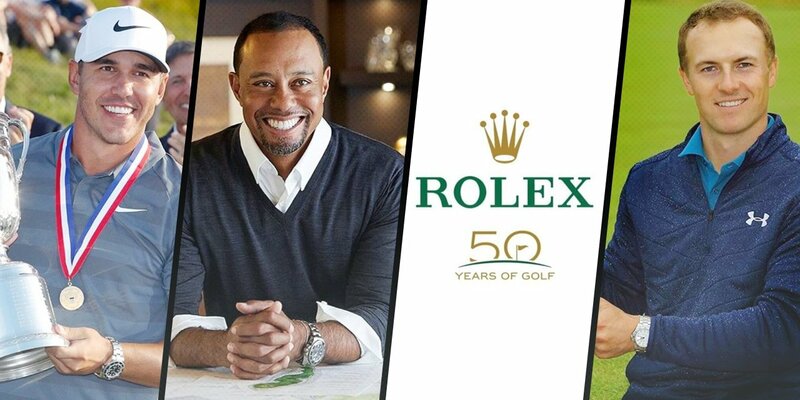 Out of the four men’s major golf championships, Rolex is an official partner of three of them—The Masters in April, The US Open in June, and The Open in July. The brand also sponsors The Ryder Cup and the President’s Cup, as well as the World Golf Championships, the World Cup of Golf, and THE PLAYERS Championship. Rolex is also very active in women’s golf tournaments. In fact, the brand sponsors all five of the women’s golf majors. There’s the ANA Inspiration, the KPMG Women’s PGA Championship, the U.S. Women’s Open, the Ricoh Women’s British Open, and the Evian Championship. Congratulations @rolex on 50 years of golf and thank you for the continued support. #Rolex #Golf For more details see the link in profile. Aside from Phil Mickelson, it’s very rare to see a golfer wearing a watch while on the course. Off the course, it’s a different story. Rolex positions their Day-Date watch as the ultimate timepiece for a golfer’s lifestyle. While this is most certainly not a sports watch, it is Rolex’s most prestigious dress watch that has become an international symbol of success. However, it’s worth noting that many of Rolex’s golf ambassadors like to wear other Rolex watches. For instance, Tiger Woods wears a Sea-Dweller Deepsea, Jordan Spieth wears an Explorer II “Polar”, Brooks Koepka wears a ceramic Daytona, Hideki Matsuyama wears a two-tone Submariner, and Justin Thomas wears a platinum and steel Yacht-Master. With a fifty-year history already behind the partnership, it’s clear that the solid Rolex and golf relationship will continue on for decades to come.